Primary sclerosing cholangitis (PSC) is a liver disease in which the bile ducts (small tubes through which bile flows from the liver to the gallbladder and intestines) progressively decrease in size due to inflammation and scarring. As a result, bile that is normally carried out of the liver accumulates within the liver, which then damages liver cells. 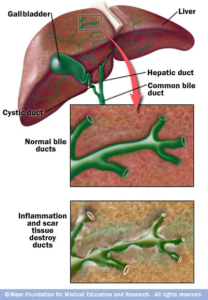 The disease may sometimes be confined to the bile ducts within the liver but most often it also affects the large bile ducts outside the liver as well. Although primary sclerosing cholangitis has been considered a rare disease, recent studies suggest that it is more common than originally thought. The disease may occur alone but frequently exists in association with inflammatory diseases of the colon, such as chronic ulcerative colitis. Primary sclerosing cholangitis affects both sexes but is more common in men. PSC is most often seen between the ages of 30 and 50. At the present time, the exact cause is unknown. However, research has demonstrated that genetic changes play a role in this condition because it often occurs in several members of a family. Immediate family members of someone with primary sclerosing cholangitis have an increased risk of developing the condition. Viruses that are known to cause hepatitis have not been associated with primary sclerosing cholangitis. In many cases, PSC occurs in association with inflammatory bowel disease. This suggests that a common cause for both diseases may exist. PSC may also coexist with another chronic liver disease called autoimmune hepatitis. This most often occurs in children and young adults. episodes of fever, chills and abdominal pain which may indicate an infection within the bile duct. If a person who suffers from primary sclerosing cholangitis develops fever and chills, he/she should go to the hospital immediately. Eventually, in the advanced stages of PSC, cirrhosis may develop with signs of liver failure. Since individuals may have no symptoms whatsoever for many years, the disease is often diagnosed because of abnormal liver blood tests. Additional diagnostic tests such as magnetic resonance imaging (MRI/MRCP) or ERCP may be necessary to confirm PSC. Endoscopic retrograde cholangiopancreatography (ERCP) combines the use of x-rays and an endoscope, which is a long, flexible, lighted tube. Through the endoscope, the physician can see the inside of the stomach and duodenum, and inject dyes into the ducts in the biliary tree and pancreas so they can be seen on x-rays. With improvements to magnetic resonance techniques, this non-invasive way to diagnose PSC is being used more frequently. Presently, there is no known specific treatment for primary sclerosing cholangitis. However, symptoms of this disease can be treated with varying success by antibiotics, vitamins and medications to control itching and improve bile flow. Sometimes, insertion of a stent with a procedure known as endoscopy may be effective short-term in alleviating jaundice and other symptoms. When the disease has progressed to liver failure, liver transplantation may be considered. Liver transplantation is successful in 85 to 90 per cent of adult patients.